What about a mobile soundsystem where we can play Brazilian grooves anytime anywhere? 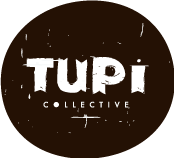 Tupicycle is our summer project: A soundsystem (2 turntables + mixer + speaker) made on top of a Schiwm 1960 tricycle customized to play Brazilian music in vinyls at the parcs and streets of Montreal. Built in august 2014 we have made good music sundays in different parks as: Park Laurier, Park La Fontaine, Park Jeanne Mance and Mont Royal metro.